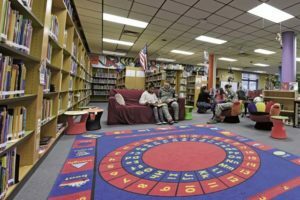 The program, “Read with Me,” is an initiative coordinated by Kerri Larimer, Vogelweh Elementary School library information specialist. Larimer says the Read with Me program is designed to provide increased opportunities for students to read aloud. This practice increases reading fluency and student reading confidence. As part of the program, kindergarten, first-grade and second-grade teachers select several students to visit the elementary school information center where they read with military volunteers. 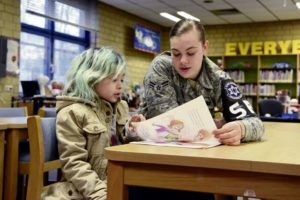 Children select a book based on their reading ability and then read to their military volunteer for up to 30 minutes at a time. Airman 1st Class Clare Hilborn, 569th USFPS police services personnel, is a Vogelweh Elementary School volunteer and has helped recruit other volunteers to ensure the program’s success. In total, Hilborn is scheduled to volunteer more than 36 hours throughout the program’s duration. Dr. Lori Hill, Vogelweh Elementary School assistant principal, also believes in the importance of this program. Due to the popular demand of this program, volunteers will read with children once per week this year compared to once per month last year. There will be no Read with Me program on April 3 and April 10 because of spring break. Parents or volunteers with questions about the Read with Me program can contact Kerri Larimer at kerri.larimer@eu.dodea.edu. Tech. Sgt. Jere Ross, 86th Airlift Wing noncommissioned officer of resources and requirements, and Airman 1st Class Sarah Marcinko, 569th U.S. Forces Police Squadron, read with children on Feb. 6 at Vogelweh Elementary School on Vogelweh Military Complex. Airman 1st Class Sarah Marcinko, 569th U.S. 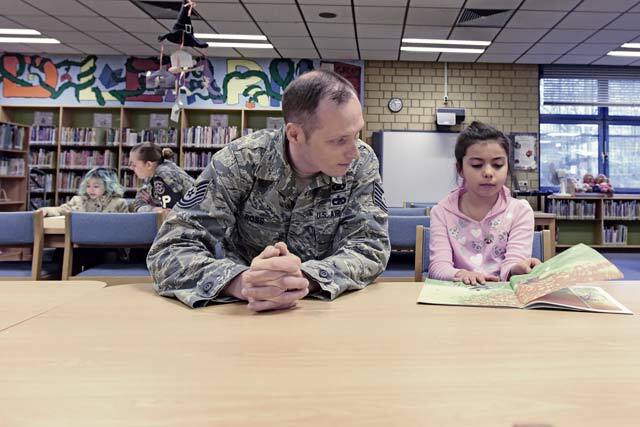 Forces Police Squadron, reads with children on Feb. 6 at Vogelweh Elementary School on Vogelweh Military Complex. The Read with Me program is designed to provide increased opportunities for students to read aloud.